If you all didn’t know, fall is my absolute favorite time of the year. Not only do I love the nice chill in the air, Halloween and all things pumpkin, but I love the color changing in the leaves. It makes it for a beautiful time of the year here in New England. With that said, I find the word “change” the perfect transition into this week’s post, as I am once again writing about Macallan. 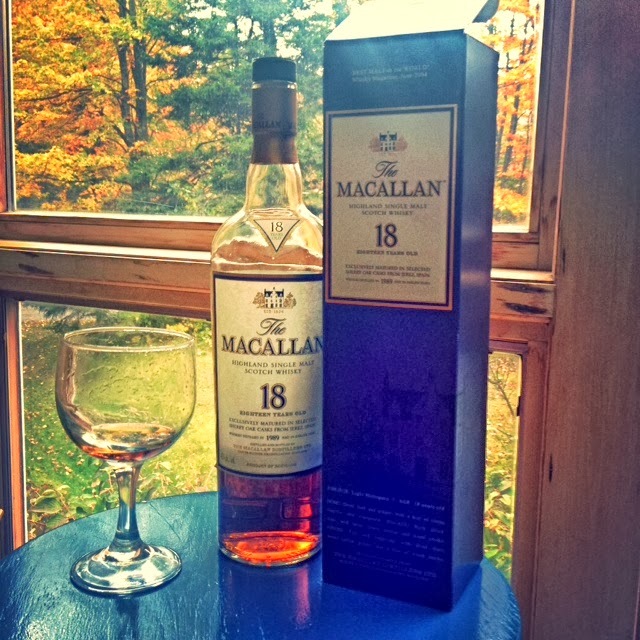 This time around its Macallan 18. For all those who continue to follow my posts, if you recall, I wrote about Macallan 12 on my August 8, 2013 post and my comments weren’t so favorable towards that tasting. No, my opinion on the 12 has not changed, but my opinion on the 18 year old is slightly different. The 18 year old like the 12 is also matured in Sherry Oak casks. The color goes into a nice mahogany color which does remind me of fall, actually. For my non whisky drinkers, what you need to keep in mind is, if the 12 was affordable then the 18 isn’t as affordable. At an average cost of $170 to $200+ it’s a hefty price, specially comparing it to the average cost of the 12 which was $40-$60. No need for me to tell you that this is a pretty significant price difference. Taste: Very light. It was smooth, fruity with just the right amount of spice. I did very much enjoy this whisky. I was actually very surprised at the smoothness of it. I found it to be extremely different than the 12 that at times, I kept forgetting I was drinking Macallan. The take away here for those just starting their whisky experiences is that if you don’t like one age of a particular brand don’t completely rule that brand out as you might like a different age on their whisky range. Although I did enjoy the 18 year old, I’ll be honest and say that would not buy the bottle. It is an expensive bottle. I fortunately got the opportunity to try this single malt during an Alumni gathering up in Vermont at the start of the month. Our college friend Kevin (I believe it is one of his favorites) was kind enough to bring this bottle as well as a few great others to share with the group. Thank you Kevin! So finally, if you’ve tried the 12 and not the 18 then I recommend you try the 18 because you will be able to note all the differences between the two. PS – In another way change pertains to this blog; I am considering changing blog platforms so look for that to come in the future.